Layers are perfect for you and your baby. Simply remove a layer if the temperature climbs or you head indoors. 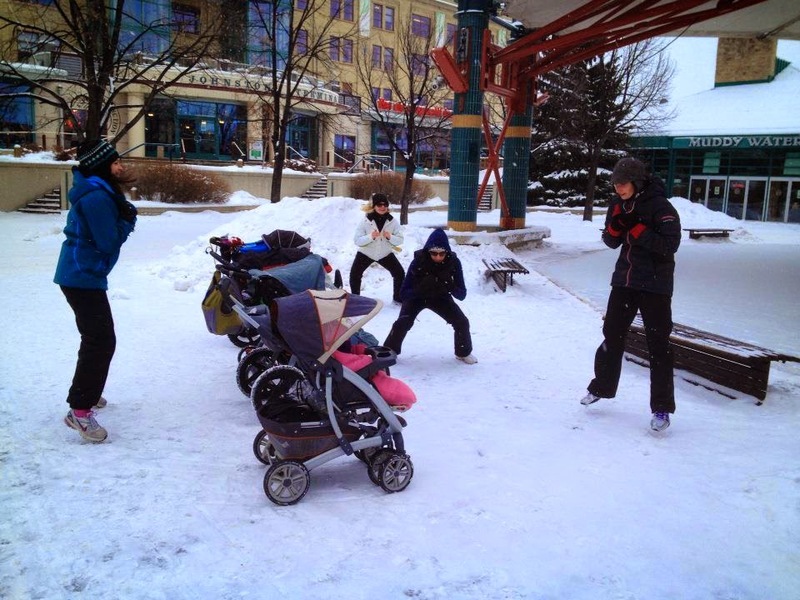 Going to Stroller Fitness or out for a jog? Dress your baby in 2 more layers than you are wearing. You might be working up a sweat, but baby is just along for the ride. For example, if you are wearing a long sleeved technical shirt and a light weight jacket, you still want to dress baby as if you were just going for a stroll. A sweater, winter jacket, hat and mitts should do it. If you use a blanket cover on your stroller, that counts as a layer, so you might nix the sweater. About 30% of body heat is lost from the head so don’t forget a nice warm hat for baby. Look for something with ear flaps. Fingers are also very sensitive to the cold. We recommend thumbless mitts for as long as your baby will wear them. Trying to get little thumbs in little thumb holes is frustrating for mom AND baby. Baby’s skin can be sensitive to the cold. We love Dimpleskins http://www.dimpleskinsnaturals.com/products.htm Kiss me Baby for keeping baby’s cheeks and mom’s lips naturally safe & soft. It comes in a tube with a key ring so you can attach it to your diaper bag for easy access. Don’t forget the sunhat, sunglasses and sunscreen. It may be cold, but it can still be bright. Be sun smart all year round. Stroller rain covers are a great way to keep baby warm and dry without blocking their view of the world. Some babies just don’t do rain covers. Mountain Equipment Co-Op’s Newt Rain Suit http://www.mec.ca is a great alternative. We recommend saving some money by going a size up as the elastic on the cuffs keeps sleeves and legs in place. Avoid slips - wear well fitting athletic shoes with good tread. Check the tread on your stroller tires too. If they are smooth, invest in some new tires. Fresh air and fitness are the perfect combination for a clear mind and a happy body. So suit up and head out for some exercise.